What is a Liquid / Water Cooled Engine? When an IC engine is cooled by either liquid or water; it is known as liquid or water cooled engine. Most modern high-end bikes, besides cars and other commercial vehicles alike; use the liquid/water cooled engine. A liquid cooled engine is very similar to the water cooled engine; albeit a minor difference. A liquid cooled engine also uses water as its main component. The older generation engines used only pure / distilled water for cooling the engine. Later, the manufacturers started using the coolant; in place of just the water. Then, it became popular as a liquid cooled engine. The coolant is a mixture of both water & concentrated coolant at about 1:1 proportion. It makes the liquid coolant mixture for the engine cooling system. Most modern day engines use a pressurized/closed system to control the engine temperature effectively. 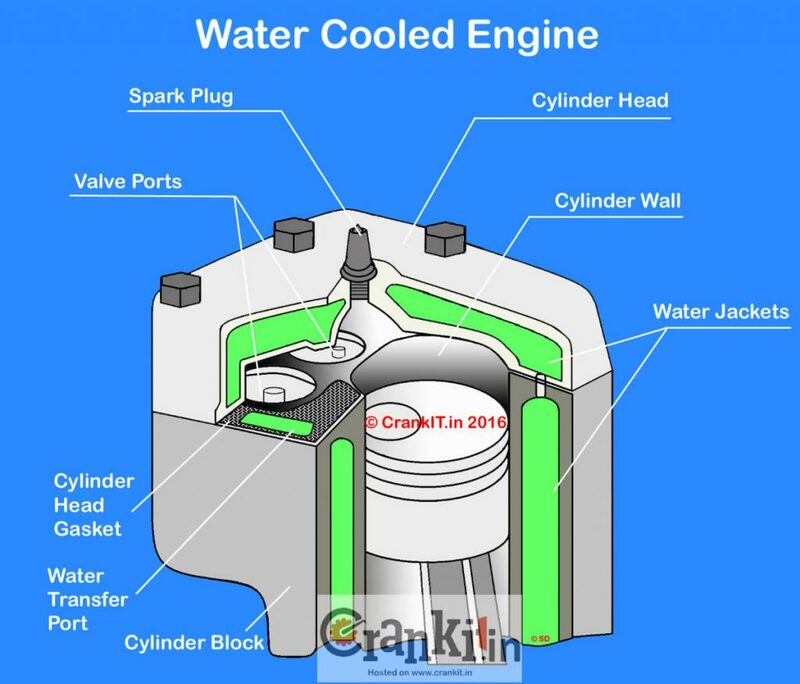 The coolant contains some additives, such as; the anti-freezing and anti-corrosion agents. The coolant, thus; prevents the water from freezing in extreme weather conditions. It also prevents causing damage to the engine. The anti-corrosion agent prevents rusting of the engine parts, such as cylinder block and head; when they come in contact with the water. It also helps to prevent erosion and increases the life of engine components; especially those made of aluminum. The coolant also helps to increase the boiling point of the water. The liquid / water cooled engine uses a pressurised and closed system. The pressurised system helps to increase the boiling point of the water to above 110oC. Hence, the water does not evaporate quickly and can be used for prolonged time. The heat from hot engine parts, such as the cylinder head and block; is dissipated by the circulating water. A cooling fan cools down the water; when it passes thru' the radiator. Water jackets are carved out inside the cylinder head and block. It helps the water to reach the hottest surfaces located within the engine and remove the heat effectively. More the surface area comes in contact with water, it dissipates more heat. Also, the water-cooled engine uses a water pump to improve the rate of water flow. As the water flows freely inside the engine, it removes the excess heat effectively. A liquid cooled engine uses a thermostat to control the temperature effectively. When the engine is cold, the thermostat bypasses the radiator. It then circulates the coolant water within the engine; to quickly attain the engine's normal operating temperature. 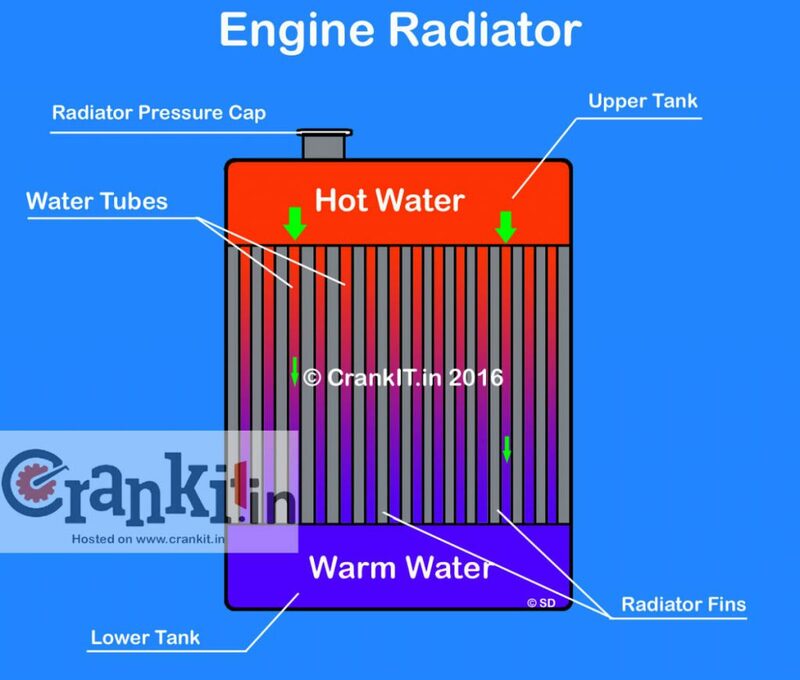 When the coolant temperature rises to certain degrees, (usually above 100 degrees Celsius); the thermostat opens and allows the coolant to enter the radiator to cool down. Water flows from radiator's upper tank to its lower tank thru' the capillary tubes; surrounded by radiator fins. 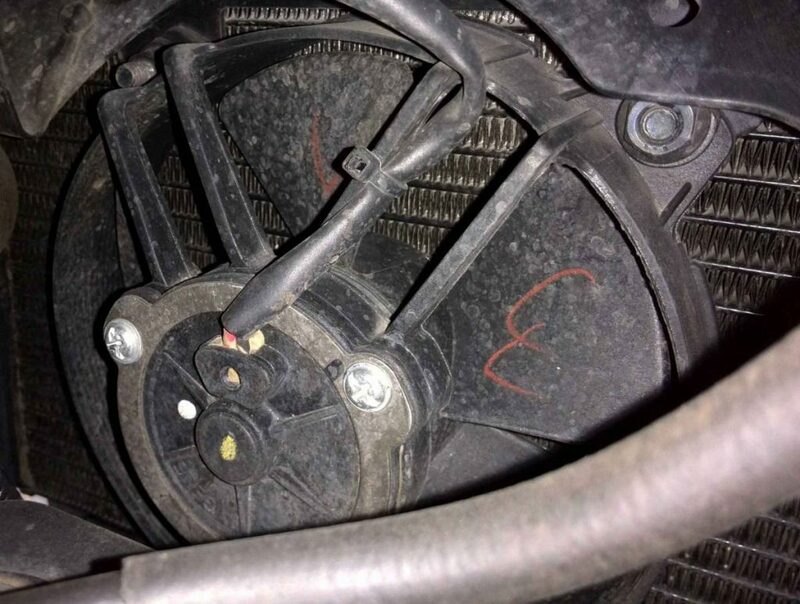 Furthermore, a cooling fan blows the air past the fins. Thus, it transfers heat from the water to the passing air. 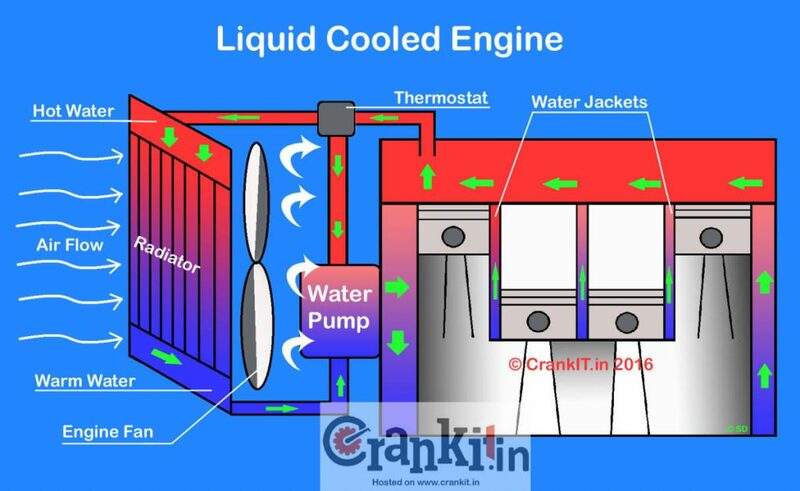 Home » Technical Anatomy » What Is A Liquid Cooled / Water Cooled Engine?